Recently I visited the Farm Innovation Show at the NEC in Birmingham, a great show with some excellent exhibits. Of all the exhibitors at the show for me there was one that stood out above all the rest. I like the unusual the properties that stand out from the crowd, my 360 photography and virtual tours are all about being different so for me anything that is unusual instantly gets my attention. Walking around the show I eventually spotted a company that specialized in round houses. What a fantastic fit for my 360 virtual tours, I spoke to the staff on the stand ( I probably took up far too much of their time ), and after the show I kept in touch with Gemma and thankfully we ended up doing a virtual tour of a round house, a task I have to say I very much enjoyed. Visiting the round house you are instantly struck by the quality of the build, and the warmth, this was a bitterly cold day and the instant you stepped inside the round house the warmth was instant. The pictures you can see on the walls are the heating system, low cost and extremely effective. 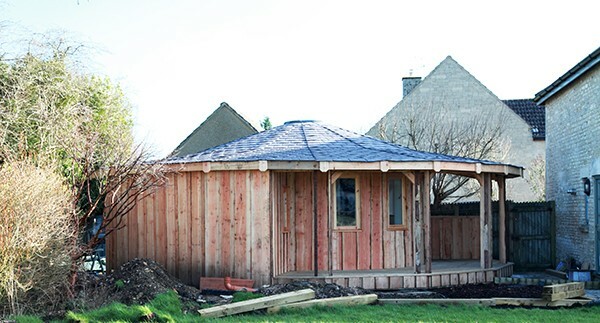 These round houses can be build to your specifications so size is not an issue, whether you want a small outside space to use as an office, or a full blown multi room home then you an be accommodated. The images above shoe the main living room, the decking outside the house, the name plate and the amazing ceiling. The quality through this property is exquisite and guaranteed to get the wow factor from anyone that visits.